FSB Development is the provider of the Inventory II module for Microsoft Dynamics AX. Since 2006 this module has been developed and distributed to companies all over the world. 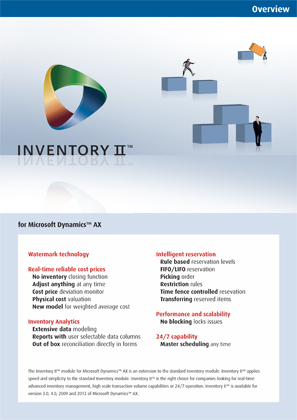 Inventory II is today sold via certified Dynamics AX partners in more than 30 countries. Today, more than 200 Dynamics AX customers with over 20,000 AX users, has chosen to implement Inventory II. The founders of FSB Development are all key software architects / developers from the original Damgaard/Navision/Microsoft Dynamics AX Development team. For more than a decade they have worked with the product that became Microsoft Dynamics AX. During the first 6-8 years of the development cycles for this product they have formed the bulk of the architect team that designed and implemented most of the supply chain modules in the standard Microsoft Dynamics AX. These include Inventory Management, Master Scheduling, Production, BOM, Routes and Work Centers. FSB Development is a certified Microsoft ISV (Independent Software Vendor). FSB Development has participated in Microsoft TAP Program for Dynamics AX 2012.